For natural wonders, history, family fun, winter sun or just a change of scene, the stretch of coast up to Ningaloo Reef really delivers. This is a story about one specific journey, but what strikes me most about travelling along Australia’s Coral Coast, from the Pinnacles to Geraldton, Kalbarri to Carnarvon, on to Shark Bay and up the Ningaloo Reef, is that this stretch of the WA coast offers complete and quite different holiday options. It is a region full of contrasts ... and it is variety that makes our travel feel longer. From Coral Bay, I look back at my photographs of the Pinnacles (sculptural, their roots set firm in yellow sand), and, well, it feels like it could have been taken weeks ago. In fact, it was just a few days. To get to the Pinnacles and seaside Cervantes and juxtapositioned Jurien Bay, I have driven just a short distance north of the metropolitan area up the Indian Ocean Drive, through banksias and grass trees, the turquoise ocean off to my left. The raw material for the limestone pillars that are the pinnacles of Nambung National Park is seashells from an earlier time when the area was rich in marine life. But we’ll see more of that later. And more too of the stromatolites, these earliest complex lifeforms on Earth that are still, most unusually, living in Lake Thetis and are thought to be more than 3370 years old. For many it will be quicker up Brand Highway to head north, but I like the Indian Ocean Drive. It brings me to the Brand Highway and I drive on to Port Denison and Dongara — nice nooks with their own sense of place. Dongara’s Moreton Terrace is lined with Moreton Bay fig trees planted in 1906 — a straightened-out necklace that is the theme of this town, where the Irwin River meets the ocean. The temptation in all these places is to stay, but this is a journey, and I head on, calling in to Greenough, with its famous leaning trees and historic settlement. When George Grey saw this region in 1839, he thought it could become the “granary of Western Australia”. Its agricultural roots are deep. Look it up and you’ll be told that Perth to Geraldton is 440km. As an estimate, you’d probably think it wouldn’t take more than five hours to get there. But it has taken me all of a pleasant and interesting day, and I detour to Wandina Beach, just south of the city, to feel the sand under my tyres. And then I stop by at the visitor centre on the waterfront in Geraldton. I want to see the merry-go-round under the giant fig tree next to it, for its association with Randolph Stowe’s book The Merry-Go-Round in the Sea. The waterfront is a revelation for the upgrades that have happened since I was last here, including a splendid playground with a Pirates-of-the-Caribbean-meets-Wii feel. Geraldton is old and new, from Stingers Fish and Chips to the cool Piper Lane Cafe, which is great for breakfast. On top of Mt Scott, the HMAS Sydney II Memorial commemorates the 645 men who lost their lives in World War II when the Sydney and German raider Kormoran met off Shark Bay, with the loss of both ships. And the next morning, after a walk through Rundle Park and along St George’s Beach, still in the early morning light, I’m standing in front of the splendid architecture of the Cathedral of St Francis Xavier. The Right Reverend Monsignor John Hawes arrived here in 1915, designed the cathedral, and work on it began the following year. Next door, and part of the beautiful cathedral precinct, is the Monsignor Hawes Heritage Centre, dedicated to the man who also designed places of worship at Yalgoo and Mullewa, and the Cathedral of the Immaculate Conception of the Blessed Virgin Mary — St Mary’s Cathedral in Perth. But Geraldton is still a place of salt air and fishing boats, boardies and bleached hair, and feet in thongs, many as flat as flippers, too. Too soon, I’m heading on up North West Coastal Highway. Nice. And there’s a particular moment just north of Geraldton where I really feel this is a journey, as I see the flat-top mesa hills of Chapman Valley — so different to southern WA. Northampton is only 40 minutes away and I park in the shade by Hampton Gardens, buying tea and a locally grown rockmelon from Burnt Earth Cafe and walking the main street. There’s a life-size knitted merino ram in a shop window, signs for “small square barley straw bales”, the epic front of the Old Convent and a welcome at the visitor centre. I’m just walking past when a lady comes out and asks if she can help. “I’m just wandering around,” I say. “Let me give you a leaflet,” and she does. Further down the street is Chiverton House Museum, with its collection of agricultural equipment. Driving direct from here to Kalbarri is just over 100km, but I recommend the scenic route, by turning west onto Port Gregory Road. The 46km to Port Gregory is a great drive, first through undulating agricultural lands and then on smooth, bitumen curves alongside the pink Hutt Lagoon. Out at Port Gregory, there’s a little settlement, a general store and vehicles on the beach. I’m looking out at Hero Passage, Whalebone Passage, Goldigger Passage; Black Rock, Bird Rock, Shag Rock. A family is fishing off the jetty, a north-west blowie as big as my thigh breathing its last on the planks. Coming this way (rather than continuing north up North West Coastal Highway and then turning in to Kalbarri down Kalbarri Road) also adds the drama of arriving through the southern section of Kalbarri National Park — Coastal Cliffs. A spot called Grandstand gives views out over the red cliffs, white froth, turquoise bays and deep blue ocean that are synonymous with Kalbarri. And then I stroll along to Shellhouse for more, and drive to the lookout at Island Rock before calling at Red Bluff, to see the town through the late-afternoon sea mist. Kalbarri is where the Murchison River spills out into the Indian Ocean, and what an exit it is. Hire boats dot the river estuary, fishing blokes and families in each, but none venture round the twist of headland that requires a run broadside to the swell before you’re out and away. But along the south side of the river, there are jetties and lookouts, and families fishing in safety. While work is under way on a new walkway in Kalbarri National Park, there are some restrictions to access to Z Bend and Nature’s Window, though tours are still going in. Kalbarri Visitor Centre will always have latest information on this. But time passes easily in Kalbarri, with plenty to see and do, and fish that seem to like to bite a hook. On the wide, soft, green foreshore, bandy legged pink-and-grey galahs snip at grass roots, rising in a squawking cloud as toddlers stumble-run towards them. These are family holidays at their best. Up on the lookout at sunset, there are couples silhouetted against the sky. Yes, Kalbarri is a destination, and if you just set out from Perth to drive there it’s an easy seven hours. I am back on North West Coastal Highway, and in the domain of classic roadhouses. And the folk at Billabong Homestead roadhouse, north of the Kalbarri Road, provide a warm welcome and are doing us proud. And 239km past Kalbarri, at the Overlander Roadhouse, comes the turn-off west for the Shark Bay Heritage Drive. 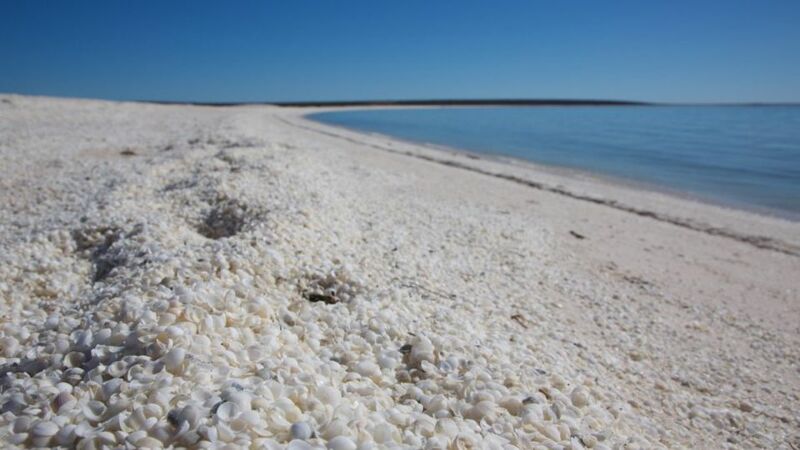 Shark Bay was designated a World Heritage site in 1991. Its sea-grass beds are among the richest in the world and its stromatolites among the oldest life forms on Earth. And after covering 96km between the Overlander Roadhouse and Hamelin Pool Marine Nature Reserve, I find the Earth’s oldest ecosystem alive and well. Wavelets wash onto the microbial mat that develops into stromatolites, with the gentle music they have always played. Nearby is the old 1884 Telegraph Station, but I drive on the 59km to Shell Beach. Here’s a mathematics test ... 4000 fragnum cockles live in every square kilometre of the 15km long curve of beach, dying to leave sparkling white shells, like billions of fingernails. Evaporation in the still, shallow water in this part of Shark Bay, where Hamelin Pool and L’Haridon Bight meet inside the Faure Sill, makes it twice as salty as usual seawater. The fragum cockle is one of very few species that can tolerate this. It releases amino acids into its bloodstream to maintain a solution in its cells which is similar to water. At the end of the peninsula are Denham and Monkey Mia, famous, of course, for its resident dolphins. It is less than 200km from the Overlander to Carnarvon, and there I’m greeted by The Big Dish. This 29.8m parabolic antenna, which was commissioned in 1969, is the OTC Satellite Earth Station Carnarvon. It played an important part in receiving communications during the Apollo moon program, and was used to track Halley’s Comet. And, of course, the movie The Dish was made about it. The interest is extended by the Carnarvon Space and Technology Museum, in Mahoney Avenue, which celebrates the part the town played in the manned space program and the Australian communications industry. But, for me, Carnarvon is still dominated by palms and sunsets, the reddish 4km sweep of Pelican Point Beach on Babbage Island, the recently improved Fascine (its waterfront), and its produce. Bananas and mangoes, vegetables of all types. There, by the roadside, row upon row of small tomatoes are ripening in the sun. And here come two more people in our story — the sort of encounters that give us great take-home moments. I stop at Morel’s, a grower with a shop. It seems impossible to come to Carnarvon without buying a chocolate-coated frozen banana, and this is the place to do it. I buy a little other produce too, and sit outside to eat that banana (ripened and frozen, they turn to a sort of caramel icicle). And then the lady who has just served me comes out with her hands cupped. In them she has a custard apple sitting on a piece of tissue paper. It will be perfect tomorrow morning, she says. I thank her and stick my hand in my pocket for money. And another person ... in Sails Restaurant I encounter the sort of waiter that can make your evening — attentive but not pushy, humorous, completely professional. Carnarvon in the morning is still and languid, and there’s coffee to be drunk in one of the outdoor cafes. But there’s also the road to the North West Cape ... to Coral Bay and Exmouth — and I’m on it. The benches at Minilya Roadhouse, on North West Coastal Highway just short of where I’ll turn off onto the North West Cape, are in the shade. A silver-grey couple on a touring motorcycle chat to a chap in a Troopie from the Territory. And then it’s the left turn to Coral Bay and Exmouth. This is it; Ningaloo Reef. The bottom of the North West Cape is peppered with big, red termite mounds, sentinel among the grasses. Coral Bay is busy. Caravans line up in People’s Park and the fishing charter guys are gutting their catch before a crowd of onlookers. The shops are full of kaleidoscopic bathers and snorkel sets. This is a place of salty hair and thongs of all sorts. The bakery is busy and a chalked-up sign outside the charter company announces: “We swam with a 7m whale shark today”. A bloke’s sitting reading the paper — licking his right index finger and leafing slowly through The West. It’s nice to have all the time in the world for that, too. At Coral Bay, land meets salt water in dramatic fashion. There’s the protected sweep of bay, turquoise against the blonde sand, the pockmarked reddish bluff to the south, and the constant, low thunder of white breakers on the outer reef. In the shallows, decent-sized spangled emperor cruise the drop-off . . . for a few metres out, you’re still up to your knees, and a few more, you’re out of your depth. Under the surface, of course, is that other-world that is Ningaloo Reef, with its 300 species of coral, 500 of fish. At the top of the cape, Exmouth is the big centre of whale-shark swimming, of course, but there’s much more to it than even that. There’s a complete range of accommodation, good restaurants and everyone seems to be doing something. The family has its snorkel sets and has driven round into Cape Range National Park, to drift snorkel at Turquoise Bay. Others will go on down to Yardie Creek, perhaps to join the tour boat. Others will be in Shothole Canyon or Charles Knife Canyon, which take us deep into Cape Range. This area was granted its World Heritage status not just for Ningaloo, the planet’s biggest fringing reef, but for the juxtaposition of Ningaloo and Cape Range. The World Heritage listing stretches from Red Bluff, north of Carnarvon, to Cape Range, the North West Cape and then the Muiron Islands, off that cape, in the north. But this is where my journey ends, for now. And I flick back though my photographs. The journey’s been easy, but I see how far I’ve come. For planning, itineraries and suggestions, see australiascoralcoast.com.au. Broadwater Mariner Resort, in Chapman Road opposite St George’s Beach, Geraldton. Scott Cogar and his team have put in a great efforts. Even the single-bedroom apartments are spacious, with a good kitchen and full lounge. The resort has a big swimming pool, and is proud of its restaurant. mariner.broadwaters.com.au. Kalbarri Edge Resort, Kalbarri. Professional staff, a warm welcome and a well-run resort. The rooms are well appointed and very clean. kalbarriedge.com.au. Best Western Hospitality Inn, Carnarvon. I’ve stayed here many times, but the rooms have had a facelift. Mine had a new bathroom and a good shower. Its Sails Restaurant is great. carnarvon.wa.hospitalityinns.com.au. Stephen Scourfield travelled independently, but with support from Australia’s Coral Coast.